Good evening. Enjoying evening drinks also today. 'Tsukinowa Junmai Ginjo' from Shiwacho, Iwate Pref. 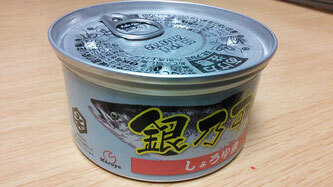 'Gin-no-suke', tinned silver salmon from Yuriage, Miyagi Pref. together, a perfect marriage. 'Hoya', simply dried sea squirt from Kesennnuma, Miyagi Pref. has just joined in the dishes. What a yummy evening time ! Silver Salmon cooked with the soy sauce of Yamagataya Shoten, Ishinomaki. A nice tinned salmon. How about a self-present for you with your favorite sake sometimes after your day work ? "HOYA", sea squirt, Tohoku Sanriku Delicacy !